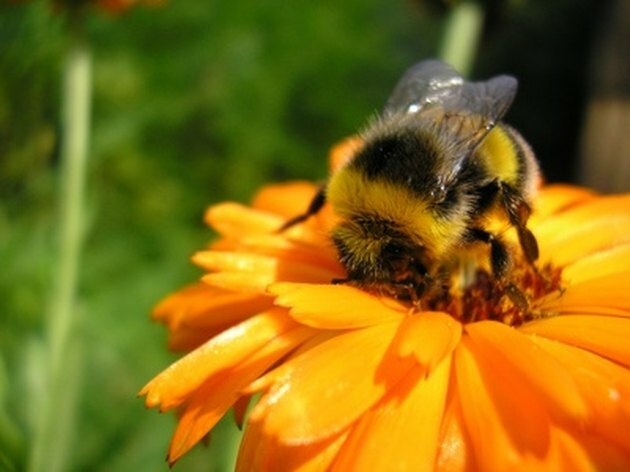 Bumble bees play an important role in pollination and, ultimately, food production. They collect pollen and report back to their nest with thousands of other bumble bees doing the same job. Bumble bees are necessary, but if they are invading your living space then your health is at risk. Bumble bees have stingers with poison that irritates human skin and can even cause allergies. There are several measures to rid your living space of bumble bees and prevent them from returning. Bumble bees are necessary, but may cause problems. Inspect the low-down, hard-to-reach places around your house. Bumble bees prefer to build nests that are under something solid and not too far from the ground. In corners under decks are common spots for bees. Outside chairs that are rarely used are also common nesting spots. Be sure to also check any object outside that has not been moved in a while that has space under it. If there is a pile of junk in your yard that you have put off cleaning up, there is a fair chance that a bumble bee nest is somewhere in there. Clean up the junk to prevent nest-building, but use extreme caution. If bees begin to swarm you, run in the other direction as fast as you can and leave the nest alone until after dark. Purchase deltamethrin dust to treat bumble bee nests that are in low-down, hard to reach spots. The dust is widely available on-line and at home improvement stores, but use caution. Follow the instructions and wear a dust mask. Keep all animals and children away. To treat a nest, simply spend an hour during the day watching the nest from a safe distance and scout out the largest holes in the nest. After dark, while the bees settle down, use a hand duster to spread a large amount of dust near the holes on the nest. The bees will die out before they know anything is wrong in most cases. If there are no bees around the nest after seven days, the nest is dead. Purchase aerosol wasp and bee insecticide, made with dichlorvos, if the nest you want to treat is larger than a basketball. This treatment kills bees on contact. Be sure to wear a dust mask and use caution. If you are treating a nest that is under loose material such as fallen branches or wood scraps, treat the nest with esfenvalerate. Apply the esfenvalerate with a hose-end sprayer over every 25 square feet you suspect to have a nest.